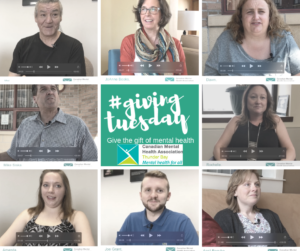 CMHA Thunder Bay invites you to join us as we participate in GivingTuesday [https://givingtuesday.ca/], a global day of giving on November 27. In the same way that Black Friday opens the shopping season, GivingTuesday opens the giving season, uniting charities, companies and individuals in the spirit of giving. Canadians participating in the worldwide GivingTuesday movement this year are encouraged to “Do Good Stuff” by joining in, giving and volunteering for their favourite causes.